Edinburgh is a place of spirits. One sort of “spirit” can be found in the Bow Bar traditional pub, tucked away on a curving street below the ridge that the Royal Mile traverses from Holyrood Palace to the Castle. Some fine beers are served here – slightly sweet, sometimes butterscotchy Scottish-style ales – along with over a hundred single malt whiskies. Just reading the names is an experience; Caol Ila, Knockando, Pittyvaich, Talisker, Tomintoul, and the unpronounceable (to a Sassenach) Bunnahabhain. But there are also spirits of a darker kind to be found in Mary King’s Close – a strange, tight-knit network of alleyways buried under the Royal Exchange. The Enlightenment gentry of Scotland didn’t even bother demolishing the old tenements in their attempt to make Edinburgh the Athens of the North; they just built on top of them. It’s a peculiar world down there, dark and claustrophobic; no wonder children were told there were ghosts in the Close and legends grew up of Plague victims being walled in. Greyfriars Kirkyard also has a restless spirit – ‘Bloody Mackenzie’, the Lord Advocate who imprisoned many Scottish Covenanters here in the graveyard and executed a good few of them too. He’s buried here in a fine domed mausoleum – another symbol of Edinburgh’s Enlightenment – but it’s said he does not rest in peace; his malevolent ghost has been known to attack visitors. Edinburgh urchins used to yell ‘Bluidy Mackingie, come oot if ye dar! Lift the sneck and draw the bar!’ – I’m not sure I would dare. There’s something about the blackened stone and the chill atmosphere that discourages levity. While many tourists visit the statue of Greyfriars Bobby, the little dog who stood guard over his master’s tomb till his own death, the kirkyard has a much more macabre side. Skulls, skeletons, hourglasses, pickaxes and spades for digging graves all figure on the gravestones and if you’re there on a winter evening, as darkness falls and the windows of the little houses that back on to the graveyard shed their yellow light on the tombs, your imagination might run riot. Another fine cemetery lies on the slopes of Calton Hill, below the fine (though never finished) imitation of the Parthenon that was intended to commemorate Scots who died fighting in the Napoleonic wars. Here the 18th century philosopher David Hume is buried in a gracious and impressive classical monument; as he requested, only his name and the dates of his birth and death are given – “leaving it to Posterity to add the Rest”. Nearby stands the gravestone of Thomas Gray and Elizabeth Wilkes, with skulls and bones tumbling down the margins of the inscription and a ship under full sail above (Thomas’s son John, who paid for the tomb, was a ship’s captain). Again, however much Hume and his contemporaries tried to make Edinburgh a pleasant, civilised town full of harmonious classical architecture, there’s a layer of macabre, dour threat underneath. 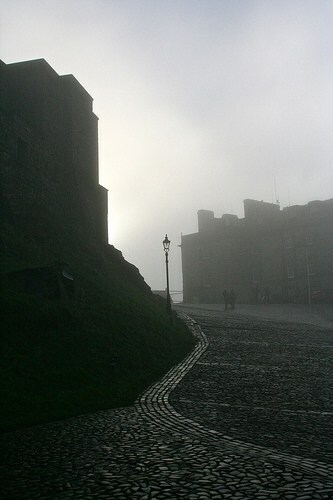 Edinburgh is both Dr Jekyll and Mr Hyde – and of course that story was written by an Edinburgh native. Edinburgh was also the home of Burke and Hare the body-snatchers. Unable to get enough bodies for the dissection table by simply digging up the dead, they started making their own corpses. They were found out in the end; Burke was hanged but Hare secured immunity by testifying against his former colleague (Burke, like so many of his victims, ended up on the dissection table; his skeleton and death mask can still be seen in the University’s Anatomical Museum and perhaps most macabre of all, there is a pocketbook said to have been made out of his skin). It can be quite fun to scare yourself a little in Edinburgh – read a ghost story, take a ghost tour, look through the little windows in the stern barred doors of the mausoleums. But when the sun starts to get low and the day darkens, I find I’ve had enough of graveyards and ghosts – and it’s time for a dose of that other type of Scottish spirit in the nearest pub! If you need a cheap Edinburgh hotel to feel safe in after your tour of the city’s dark side, I’d recommend Tune Edinburgh located opposite Haymarket station. Great to read through the city I love and live. Nice outline by Andrea and I just love the ghostly history to the city. I have been to almost all the ghost tours that the city has to offer and it is worth a trip always. Thanks for posting Keith. I wasn’t aware Edinburgh had such a ghostly history. I do know it’s a wonderful city to visit though and like you I can usually be found enjoying the spirits in the local pub or bar ;). I would love to take a ghost tour there! Interesting post. Edinburgh certainly had a lot of history to share. I’m such a scaredy-cat that I don’t think I could ever go looking for things that go bump in the night! I keep meaning to go to Scotland again. I must move it up my “to do” list!